Posted: December 24, 2017 in Obscurities, Who,What,Where & When...? The West Australian pair left Freo in the 856cc, 4 cylinder, 3 speed small car on 1 May. Phipps originally intended to make the trip on a motor cycle and sidecar but received an offer from the Citroen agents to use the small car instead, he then invited Seery to accompany him. 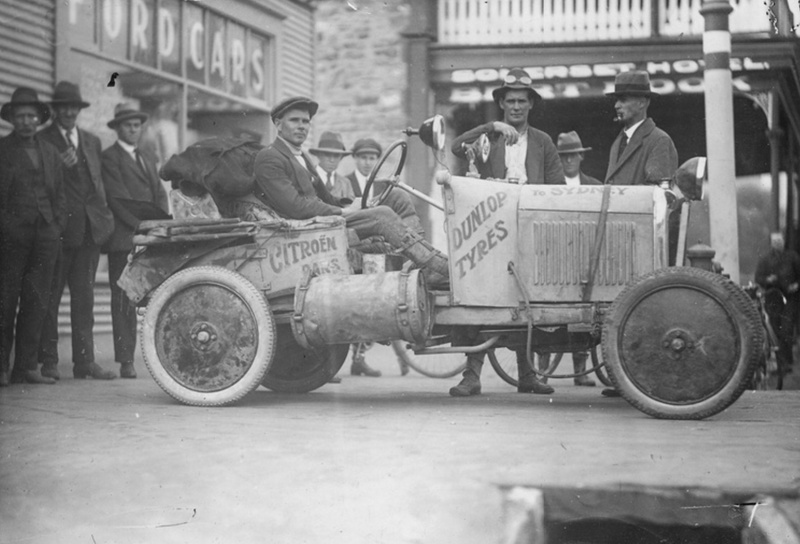 In various reports described as a planned as an attempt on the Fremantle-Sydney transcontinental record, or to prove a small light car could make the challenging journey, the trip became a ‘more leisurely touring drive’ after the loss of four days due to hub damage. Phipps quipped that ‘When we left Perth we were the laughing stock of all motorists because no-one dreamed we would be able to get through’. Even the cars agents were somewhat dubious about their prospects. The intrepid adventurers travelled all day and night, one sleeping whilst the other drove. The route chosen took them from Fremantle to Kalgoorlie (WA) Port Augusta to Adelaide (SA) Melbourne and then on to Sydney (Victoria and NSW respectively). The Perth ‘Daily News’ reported that ‘Despite the fact the whole outfit with luggage weighed 18 cwt, (including 23 gallons of petroleum benzine and 8 gallons of water) the little car had no difficulty in negotiating this heavy route’. For hundreds of miles, the pair followed the transcontinental railway line as much as possible, there was no track at all, with large limestone boulders having to be moved before they could proceed. The car was delayed by four days near Naretha, 180 miles from Kalgoorlie on the transcontinental railway line, ‘owing to one of the wheels crashing into an obscured stump’ the Citroens hub was broken necessitating a spare to be delivered by rail from Perth. Apart from that mishap they ‘never had a spanner on the car’. The most challenging part of the trip were the Yardu Sandhills in central WA where the Citroen got through unaided, taking five hours to go 12 miles. Other heavier cars on previous trips having to be hauled through by bullock teams. Adelaide was reached in 157 driving hours on 11 May, this section of the trip was 1,769 miles. Behrens and Marshall (another report says Maugham-Thiem Motor Works) were the Citroen agents in Adelaide, the photograph of the car is out front of their Flinders Street showrooms. The car then set off for the 571 miles to Melbourne at 2pm that afternoon 11 May. The other most difficult leg of the trip was the section near Kurow Lake, there, instead of being axle deep in sand, they were axle deep in mud. They arrived in Melbourne at 8 am on 14 May. After a days rest Phipps and Seery then set of for the 594 mile Sydney leg at 10.45 pm on 16 May via the Hume Highway route. They stopped for a night in Gundagai, wet and cold from exposure and set off again on Saturday arriving that evening, 19 May ‘…in Martin Place with West Australian air’ a quip referring to the fact that the tyres had not been pumped up at any time on the journey. The car was shod with Dunlop ‘Railroad’ tyres, averaged 38-44 miles per gallon, used 1.5 gallons of lubricant with the average speed for the entire trip 16.5 mph. In a parting shot Phipps said ‘We are on a holiday trip…we will return in the car…we intend on the way back to the West to have some dingo shooting on the Nullarbor Plain’. I wonder if this significant Citroen survived? I notice on the bonnet “…to Sydney…”? Have another look at the article- there was more to the journey than the photo caption suggested! Aaw sorry, you’re right….Merry Xmas!